A former University of Maryland student pleaded guilty to involuntary manslaughter on Friday after a man he punched outside a bar near the university campus died more than a year after the attack. Arasp Biparva, 24, punched Jack Godfrey in the head once as he walked out of a bar in College Park, Maryland on March 27, 2013, according to the Prince George’s County State’s Attorney Office. Godfrey fell backwards from the blow prosecutors called a sucker punch and slammed his head against the ground. He suffered serious injuries to his skull and brain. 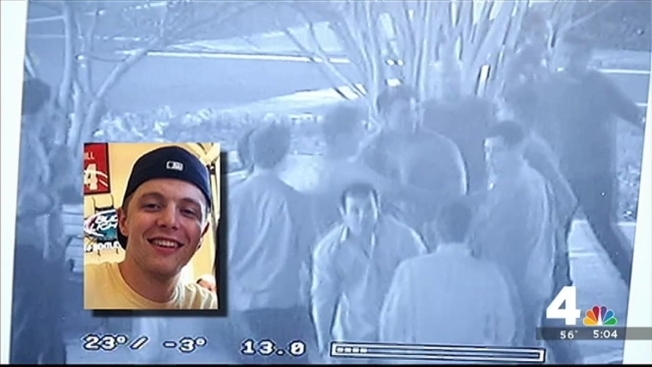 Surveillance video shows him unconscious, being pulled from the street by friends. Godfrey seemed to recover, and Biparva pleaded guilty to second-degree assault in October 2013. He was sentenced to 10 days in jail and ordered to pay more than $19,000 in restitution. Godfrey, 21, was then found dead in his fraternity house on Nov. 7, 2014, the University of Maryland's student paper reported. An autopsy determined he died from a seizure, head injuries and aseptic meningitis, all resulting from the single punch Biparva threw outside Cornerstone Grill & Loft on Baltimore Avenue, prosecutors say. Biparva, an accountant, then was charged with involuntary manslaughter. Prosecutors are seeking a five-year sentence and could have sought 10 years. "We do understand that Mr. Biparva did not intend to kill Mr. Godfrey when he punched him, but that was the end result," said John Erzen, a spokesman for the Prince George's County State's Attorney. "There certainly needs to be accountability and punishment for that." Godfrey was a journalism major and dedicated sports fan, the student paper reported. Biparva will be sentenced in April.